For reservations for parties of 5 or more, please call (906) 723-2091. Island Club discounts and redemptions, and bus discounts accepted. We’ve got ANOTHER shirt for you! 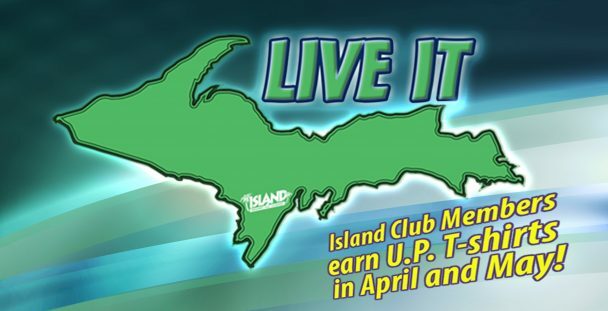 Island Club members, keep earning your shirts through May. 5 Bridges Seafood & Steak House, 5 Bridges Pub, Signature Subs & Pizza, Firekeeper’s, Coral Reef, T. McC’s, Coffee & Bakery, Custard Shop. Mark your calendar for The Island LIVE IT UP Party on June 14 for fun and prizes! *One t-shirt per person, while supplies last. Must have receipts from purchasing all three grilled cheese sandwiches to cast vote at Island Club. Original receipts from time of purchase required. Promotion subject to change at management’s discretion. 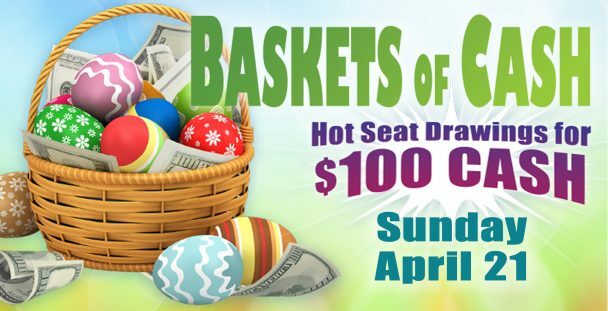 Join us Sunday, April 21 (Easter Sunday) for HOT SEATS drawings for $100 CASH from 10 AM – 10 PM EST. 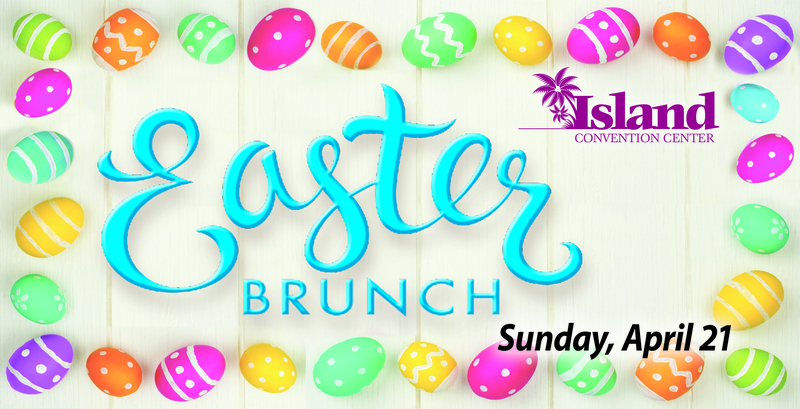 Looking for an Easter Brunch too? Check out the menu and details for our Easter Buffet. We’ve grilled up something special for National Grilled Cheese month! 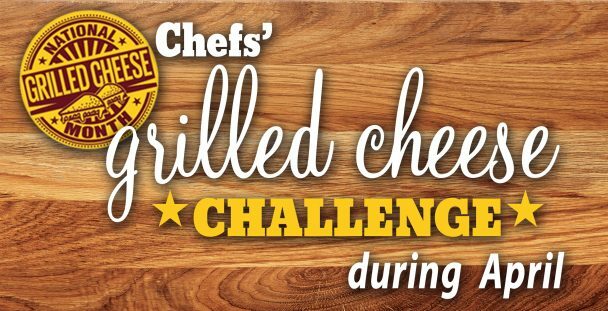 Take part in our Chef’s Grilled Cheese Challenge all month long and earn a Dine It UP shirt as well as indulging in delicious but different grilled cheeses from T. McC’s, 5 Bridges Pub and Coral Reef. T. McC’s – The Fan Fave: Our popular spinach dip mixed with artichoke and stuffed inside layers of Swiss and mozzarella cheeses on tasty marble rye bread. 5 Bridges Pub – The Medalist: Delicious layers of smoked gouda, provolone, white cheddar curds, marinated tomatoes, crispy prosciutto, and griddled to perfection on sourdough bread. Coral Reef – Italian Delight: Provolone, mozzarella and parmesan cheeses, alfredo sauce, fresh basil and tomatoes between two pieces of sourdough bread grilled to perfection. Check back in May to see which Chef takes home the title of Grilled Cheese Champ! 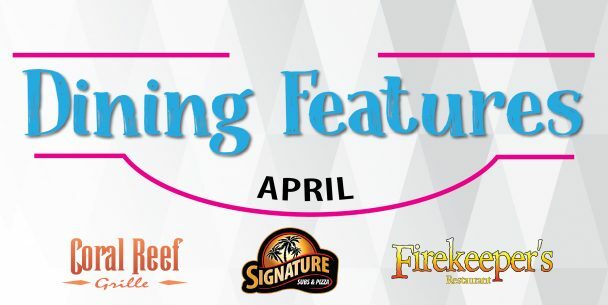 Island Club members: Purchase all 3 grilled cheese sandwiches during the month of April, pick your favorite and cast your vote at the Island Club to get your FREE Dine It U.P. t-shirt. *Must have three valid receipts from time of purchase to enter. One t-shirt per person, while supplies last. Submit votes at Island Club. Promotion subject to change at management’s discretion. 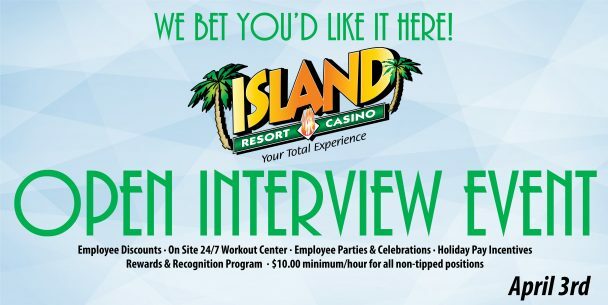 We’re having an Open Interview Event on Wednesday, April 3 from 3 PM – 5 PM EST at Club Four One! 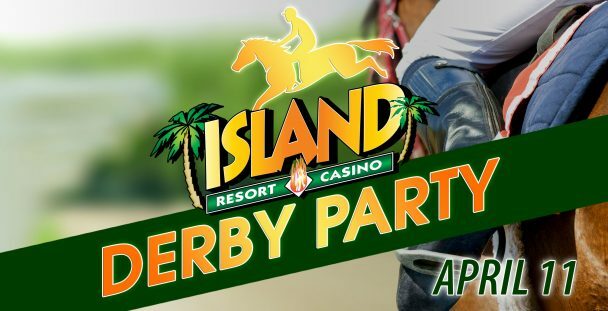 Join us for a Derby Party at the Island Convention Center on Thursday, April 11 from 7 PM – Midnight EST. Music starts at 8 PM with Rick K & the Allnighters. Enjoy random prizes throughout the evening, Derby theme snacks, drinks in a take-home souvenir cup and a GRAND PRIZE announced at midnight for $2,500 trip to Louisville, Kentucky. Enjoy a delicious and filling BLT Sub Combo (with chips and drink) for $7.99. Order up! This feature is only available for ONE DAY (April 27). Get a Steak & Cheese Sub Combo (with chips and drink) for $9.99. Meatball Bowl – NEW ITEM! 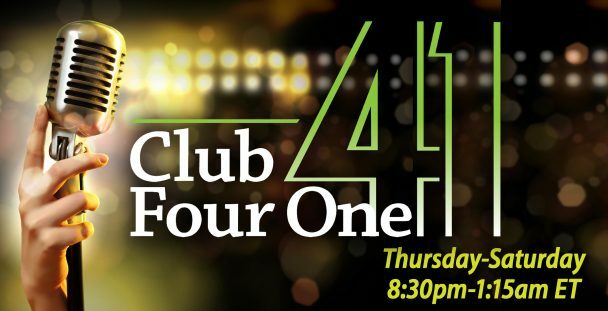 Appearing in Club 41 through April. 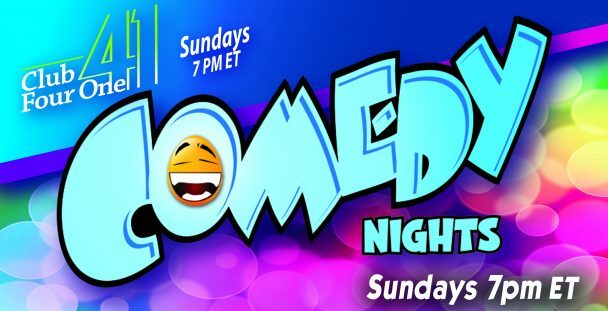 Shows start at 8:30 PM – 1:15 AM EST. *Asterisks indicates a local band that only performs on Friday and Saturday. All acts subject to change. Must be 18+ to enter Club 41. Must be 21+ to consume alcoholic beverages. Laugh until your sides hurt with these Bonkers Comedy Club comedians! Thank you for your services, veterans! 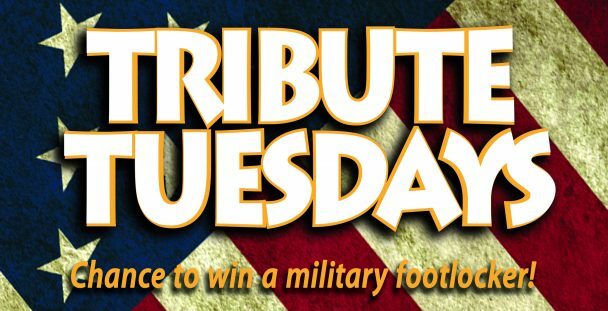 We want to show our appreciation for you every Tuesday at the Island. Visit the Island Club to present your military ID and register to win our popular Relic Wood Handcrafted Footlocker Gift, customized with your branch of service. Looking to win $100 cash?! 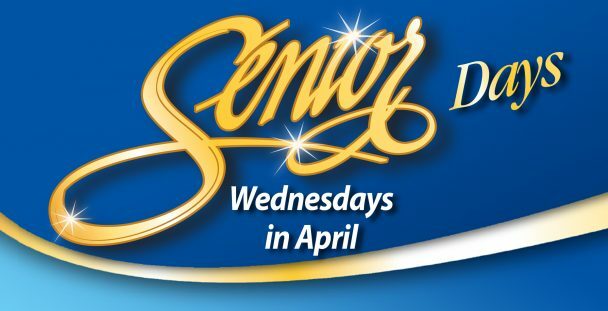 Well if you’re an Island Club member aged 55 and up just visit any kiosk to register to win cash every Wednesday in April! $100 CASH winners each week. We have been coming to your events for a long time, but yet we never get a free night when our other friends get free rooms. Can you help? Player rewards are based on several factors in addition to points earned on recent play activity. Evaluation is done by computerized analytics and takes all your gaming criteria into consideration when placing players in the appropriate predetermined package. These formulas are not something we have available to us. All packages are not the same offers and dates may vary. If you would like to speak to someone regarding the current rewards or points you have available on your card please call the Island Club at (906) 723-2126. We will be having a Mother’s Day Buffet. The information is available on our website: https://www.islandresortandcasino.com/mothers-day-buffet.